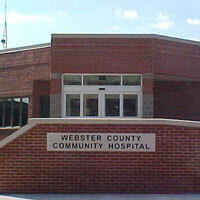 Webster County Community Hospital - Old: Physician Recruitment. In our growing market, Webster County Community Hospital is always looking to facilitate an adequate number of physicians to insure our growing patient population has the coverage required. If you are interested in this market as well as an excellent growth opportunity, please select your specialty below for our online CV submission form. Red Cloud, Nebraska is a beautiful area with an ideal climate. Learn more about our region and our growing community. What better place to practice medicine than in a modern clean healthcare facility, in a pleasant area of Nebraska.